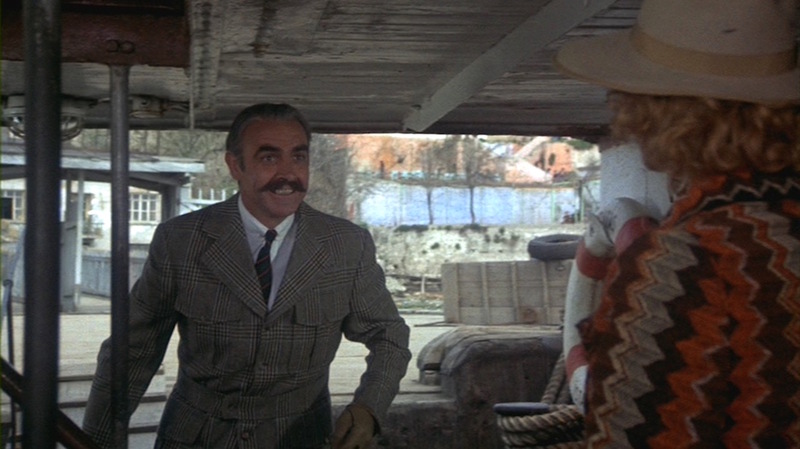 After playing James Bond in six films over the course of a decade, Connery was more than tired of the demanding role that had made him a star, and he began seeking work in different projects. One of his first films after putting 007 behind him (for the second time) was as part of the ensemble cast of Murder on the Orient Express, a 1974 adaptation of Agatha Christie’s classic 1934 mystery novel. Though the 1974 film has been well regarded by critics, audiences, and – perhaps most importantly – by Christie herself, a fourth adaptation of Murder on the Orient Express was recently announced with Kenneth Branagh in the iconic lead role of detective Hercule Poirot. This latest adaptation, scheduled for release in November 2017, thankfully retains its period setting but re-imagines Connery’s ex-military character as a doctor, played by the talented Leslie Odom Jr. of Hamilton fame. 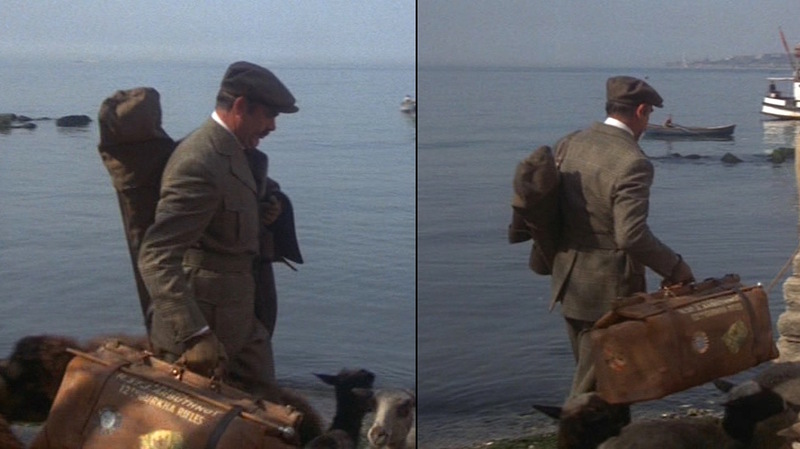 The “old school” Colonel Arbuthnot looks every bit the traditional British sportsman in the plaid flannel half-Norfolk jacket and tweed “plus fours” that he wears for his introduction in Murder on the Orient Express. 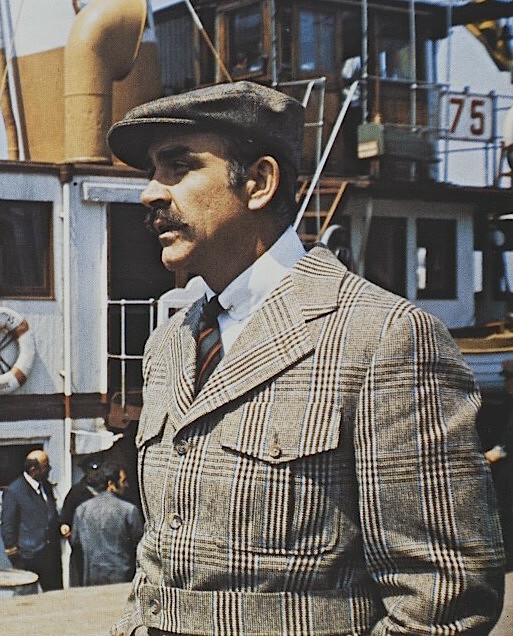 Though this outfit may be better suited for the country, it isn’t the first time Sean Connery played a character wearing plaid suiting on the Bosphorus ferry. The jacket’s brown-and-tan plaid pattern is formed with sets of woven twill stripes alternating between tan and brown over a dark sand birdseye ground, crossing vertically and horizontally to create a large-scaled plaid check. Each set of nine stripes – five tan, four brown – are bordered by a thin light blue stripe on each side. The horizontal stripes are more muted than the vertical stripes. Colonel Arbuthnot’s plaid on display while embracing Mary Debenham (Vanessa Redgrave). 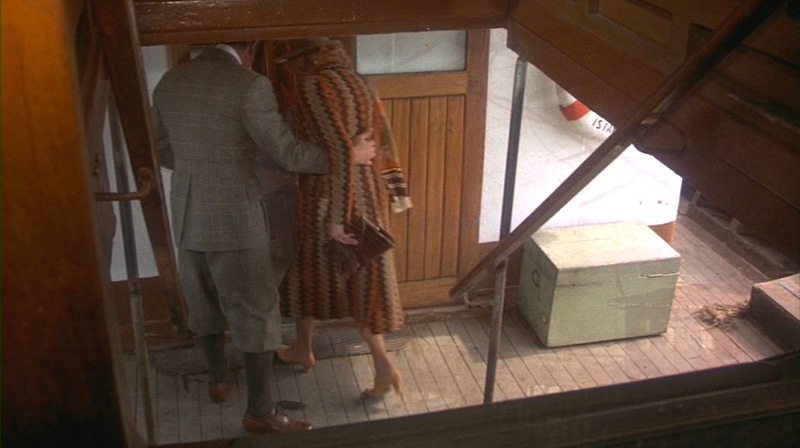 Unlike the dark herringbone tweed half-Norfolk jacket that Connery wore in the pre-credits sequence of Diamonds are Forever (featured in last Saturday’s post), this half-Norfolk jacket has two pockets on the chest in lieu of front pleat strips. All four of the jacket’s front pockets are inverted box pleat patch pockets with pointed button-down flaps. The single-breasted jacket has wide lapels with large notches, a likely indication that this jacket was made for the production rather than a vintage piece from the 1930s. It has four horn buttons on the front with a smaller button on the front of the full belt. The spaced two buttons on each cuff are also made of horn. The jacket has a long single vent in the back that extends up to the belt. Arbuthnot’s bag identifies him as an officer of the “12th Gurkha Rifles” which, according to my research, never existed. Colonel Arbuthnot balances his loud jacket with a solid white cotton shirt. Connery presents a dignified image of military correctness in the shirt’s point collar, held with a gold collar bar under his tie knot. The shirt also has double (French) cuffs, likely fastened with gold cuff links as he would later wear with his houndstooth three-piece suit. Arbuthnot’s striped repp tie is likely the Gurkha Brigade regimental tie, befitting Arbuthnot’s service as an officer with the fictional “12th Gurkha Rifles”. The design consists of three thin black, red, and black stripes crossing from the left shoulder down to the right hip on a forest green ground. Gurkha Brigade ties are available for £55 from Benson & Clegg (link) and Ben Silver for $128. 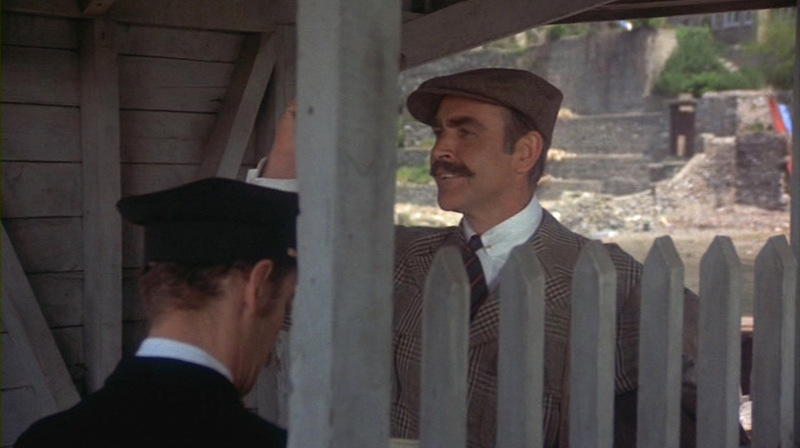 Colonel Arbuthnot eagerly greets Mary Debenham after boarding the ferry. The Norfolk jacket may have a long heritage dating back to at least the 1860s, but it remains a timeless if traditional-leaning piece of men’s countrywear. 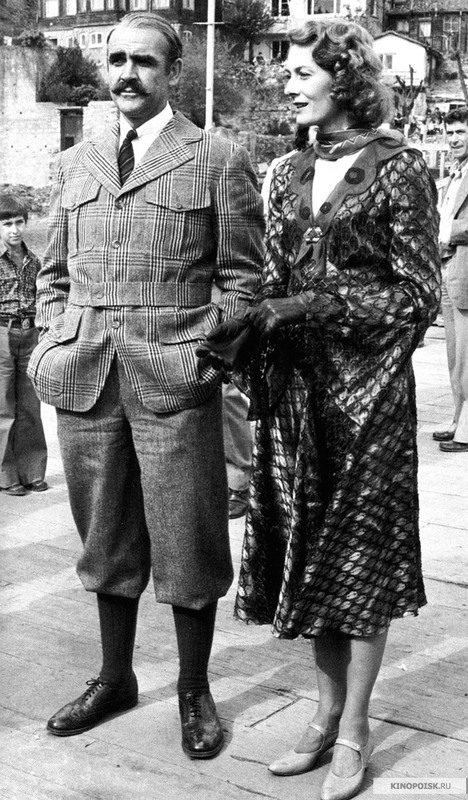 On the other hand, Colonel Arbuthnot’s brown tweed “plus fours” considerably age the outfit. “Plus fours” were named for the four additional inches that they extend below the knee, allowing its wearer greater movement for athletic pursuits. 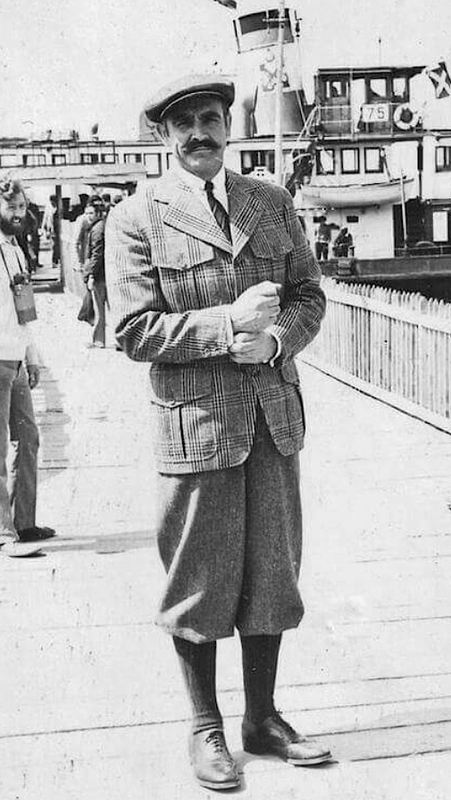 Not as old-fashioned (or juvenile) as knickerbockers, the slightly longer plus fours continue to enjoy some popularity by traditionally dressed golfers, bicyclists, and André 3000, though their heyday was arguably the mid-1920s after the Prince of Wales introduced them to the United States. The defining characteristic of all knickerbockers, including plus fours, are the short bottoms which are worn tightened up the calf to allow the loose trouser fabric to blouse out over the knees. In the case of plus fours, these would be worn four inches below the knee; I’m sure you can deduce on your own where “plus twos” or “plus eights” are worn. Hosiery can make or break the plus fours effect, but Connery correctly wears a pair of tight dark brown ribbed socks that provide the desired look. Connery also wears the same brown leather five-eyelet wingtip oxford brogues that he wears throughout the film. Dismissing Poirot as “obviously a frog” (but he’s Belgian! ), Colonel Arbuthnot escorts Mary inside. The obvious headgear for such a country-inspired outfit would be a brown tweed flat cap which Colonel Arbuthnot wears until gallantly removing it when he finds himself in Mary Debenham’s presence. Boarding the ferry, Arbuthnot also removes the mustard-colored leather work gloves that he had worn when carrying his bags. 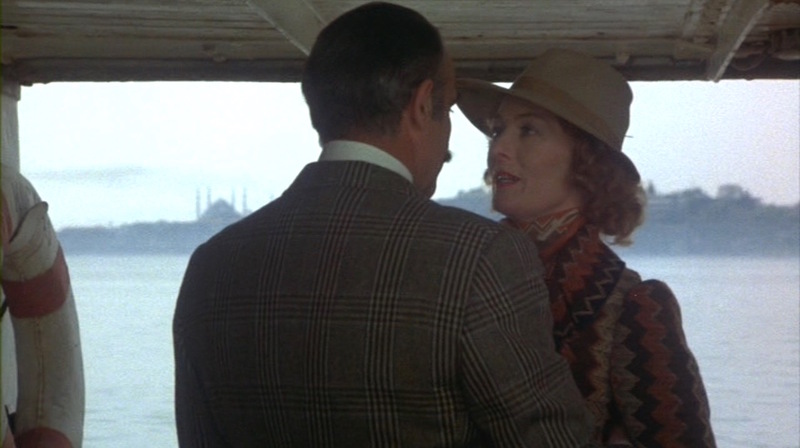 Colonel Arbuthnot infuses his traditional country outfit with old-fashioned sensibilities for his Bosphorus crossing. Buy the movie and book. I’ve just acquired this movie on dvd and enjoyed re-watching it with an eye on Col. Arbuthnot’s sartorial choices. Thanks as always for the details you record.